Our Coco pole replaces moss laef stick.In enviro-friendly turning world .Our world celebrating WORLD ENVIRONMENT DAY we should not spoil our forest for moss leaves.The Coco pole in a pot withstood the sunny & rainy seasons. Still its life goes on as in the image.Nursey people are giving a serious thought. We are a unique name in this industry to provide our prestigious clients an exclusive range of Coir Plant Pole. Coco poles are made from Coir Fibre which is wrapped around a wooden stick used in gardening. Coco poles acts as a support stick and promotes plant growth. Coco poles being porous, helps the plant to develop many tiny roots throughout surface. Plants grow healthily in Coco poles. We are the Coco Pole manufacturers and exporters in india. We have a manufacturing unit of Coco pole in pollachi, Coimbatore, South tamilnadu. We are the major exporters of Coco pole Netherlands, Turkey, South Korea, UK, USA, Malaysia, Australia, China markets. Our company has gained immense experience in the field of presenting Coir Plant Pole. 2. 100% Coconut Fibre around a Bamboo Stick. 4. Availbale Size : As per Customer need. Matching up with the ever increasing requirements of the customers, our company provides quality assured assortment of Coir Pole. Support to climbing plants.Made up of natural coconut fiber.Enviornment friendly. Coir Pole is a plant support and a growing aid manufactured using 100% environment friendly coconut fibers. Widely used in plant nurseries, horticulture farms and indoor and outdoor horticulture decorative. 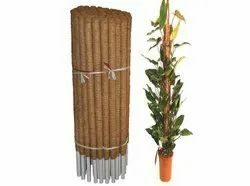 Coco poles are made by wrapping coir twin around PVC pipes. Coco poles gives ideal support to plants while creating a perfect moist environment for its roots. It's ideal for creepers like ornamental plants & even vegetables. Coir Poles or Moss Sticks are supporting poles for potted plant creepers used in both large and small scale gardens.